Gift Baskets are all of the rage these days. Today, Gift Baskets include quality gourmet food products from all over the world in unique and exotic containers made of wood, porcelain, metal, glass, hyacinth, sea grass, leather and even edible chocolate. The days of the cheap “Cardboard Gift Baskets” are almost gone - thank goodness! Tip #1 - Think of the Gift Recipient First - Does the gift recipient love chocolate, sports, coffee, tea, the spa or fine wines? Are they a school teacher, a child, a new mother/father or environmentalist? Is their personality outgoing and fun or more serious and introspective? The Gift Basket you create should reflect the gift recipient’s personality and life experiences. If they are from France and miss home, you might want to consider a rare French wine, chocolates and lavender soaps. If they love chocolate, include chocolate items that they cannot get at the local grocery store or chocolatier. 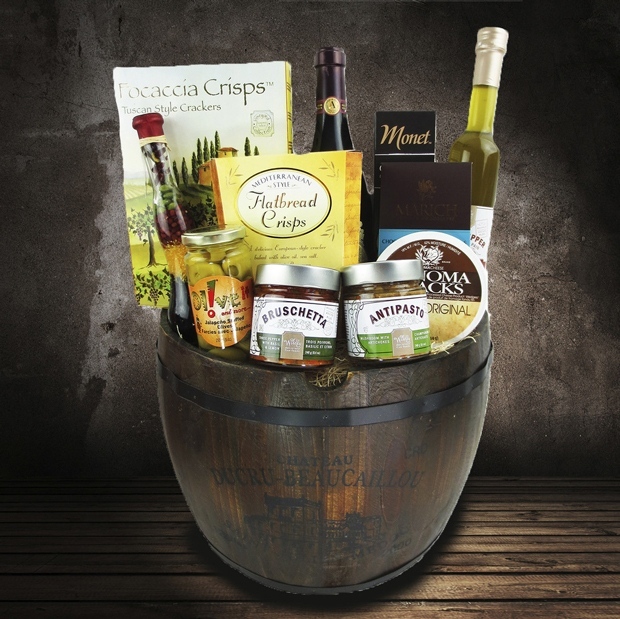 Tip #2 - Think of Yourself Second - A Gift Basket is a reflection of your personality, your tastes and your likes as well. Try to include things that reflect your life including your family and work. If you have just travelled, include a unique item from your travel. If you love German beer, include a few so you can enjoy them on your next visit. If you have a special love of Belgian chocolate add this. If you and your gift recipient loves music by Adele or Madonna add a CD of this music. If you have a picture of your family, add a beautiful picture frame of your family. Tip #3 - Include Something Personal You Have Made or Use Together - You can add something homemade or something that you and the gift recipient have in common. If you are both golfers, add golf balls and your last score card (even if it wasn’t too good). If your gift recipient is a foodie, add a small dessert, squares, jam or pickled beets that you have made. You could add a personal touch with a hand-made card or their favourite bottle of scotch. If you both like Tim Horton’s, add a pound of coffee, a Tim Horton’s mug and a fresh donut. Tip #4 - Choose a Unique Container - Wicker baskets are handy but many gift recipients don’t know what to do with these baskets after they receive them. Some gift recipients already have 10 wicker bread baskets! We suggest using creative containers such as a cutting board, ceramic or glass platters, a picnic basket, a wooden half barrel, a wagon or toy, a wine crate or box, a barbeque set case, a bucket or a diaper bag for the new mom. Garage sales are great for sourcing unique, antique/rustic containers. Tip #5 - Choose the Right Filler. At Hazelton’s, we use excelsior as the filler in most of our Gift Baskets. Excelsior is a fine wood shaving (it looks like fine straw) that is commonly used by wineries to pack fine wines. We like excelsior because it is environmentally safe, bio-gradable and most importantly very attractive. It is a bit more expensive than traditional fillers, but it is worth the price. Alternatives to excelsior include crinkle paper (comes in dozens of colours), Easter basket grass, shredded newspaper, tissue paper, dried or fresh flowers and pom pom flowers. Tip #6 - Spice it Up - If you have thought of the Gift Basket recipient, chosen a general theme, included a personal item and a unique container, it is time to spice it up. Add a number of items to the basket that are consistent with your theme and items that relate but have a different use. 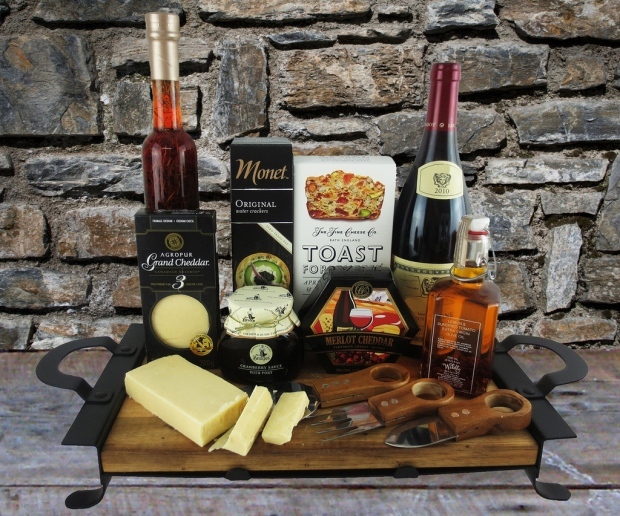 For example, if you are doing a foodie basket with olive oils, crackers, cheese and wine, you might want to add a few spa items and a fancy, birch bark candle. Or maybe a pasta bowl or a plush toy for the gift recipient’s kids. For the foodie with a dog or cat, you might want to add some pet treats, a collar or toys. Tip #7 - Size Does Matter - With a Gift Basket, it is important to use a variety of sizes so that all of the items can be appreciated in a quick glance. Tall items usually go to the back and smaller items to the front. In some cases, you might need to stack items to maximize the impact; for example, it is aesthetically pleasing to stack body soaps and lotions on towels or bath robes. You can also add bottle holders to wine bottles to fancy things up. If you find that the basket is a bit empty, you can add some less expensive items like crackers, cookies, bread, tea or a plush toy. Tip #8 - Create Eye Candy - To create something that is purely aesthetically pleasing is always a challenge but is often satisfying. With Gift Baskets, eye candy is created by making sure all of the related and unrelated items in a Gift Basket are unified and evenly spaced. Soft thing should soften hard things. Metal and glass items usually look best when they are grouped in 3’s, 5’s or 7’s. Fruit also works best when grouped in odd numbers; a bunch of single fruits in a fruit basket is less attractive than three apples, five oranges and a seven kiwis for example. Colour should be also considered. It is better to repeat colours sporadically in a Gift Basket than group all of one colour in a single area. Tip #9 - The Internet is Your Friend - When your basket is almost complete and you would like to add one more detail, Pinterest, Instagram and other image sharing sites are a great tool to help find that special item. Tip #10 - It’s All in the Details - The finishing of a Gift Basket is often the most important step if you want your Gift Basket to be remembered. A handmade bow with dried or fresh flowers interwoven into the bow adds an exquisite detail. Hanging truffles in a small organza bag or a Christmas ornament from the bow is a nice touch as well. Dried or wired flowers or decorations inserted into the Gift Basket help to fill voids and adds character to the basket. Another effective final touch is adding a handmade card, postcard or picture to the outside of the basket. Happy Gifting and Happy Holidays from Hazelton's.